Daniel Pigeon and I are thrilled to be exhibiting at the Pumphouse this month. “Common Ground” features new work, each in our own respective styles, focusing on the beauty of Niagara landscapes. “Common Ground” arose from an admiration for the Niagara region, an area that glows with hot summer days that are cooled by the lake breeze, and that brims with lush fields and sparkling rivers. In this exhibit, Daniel and I have portrayed various Niagara landscapes using our own individual styles. Whether the subject is a shadow cast across a wheat field or the swirl of a river’s eddy, we are searching for the basic patterns, colours, and shapes which emerge from the land. Whether an artist is an abstract or a representational painter, painting is all about light, the subject that makes the art of Rembrandt, Turner, and Letendre so compelling. To omit all details from a landscape, one is left with the essential; the essence of light. The light that sprawls across Niagara is unique. Though our treatments differ, we share a deep awe and respect for light. Though Dan finds gloomy and foggy winter days to be especially moving, the aspect he admires most about light is its ability to obscure a landscape in any season. He associates light with the human experience of contemplation, an energy that permeates all aspects of human life. I, on the other hand, admires light’s ability to create a full range of values, temperatures and levels of intensity, and is particularly drawn to strongly lit scenes such as the glow of the sun dropping behind a dark tree line. For this exhibit, we began by making a small sketch of the scene in order to capture its essence. As we moved from sketch to finished piece, the sketch served as a reminder of our initial impression of the scene, and helped us to resist overworking so as to let the nature and textures of the land — and the trees, sky, clouds and water — to come through. The initial image, sketch, and larger piece are exhibited together to allow the viewer to see the stages of our respective creative processes. Looking to be a looser, more painterly painter? Well, this workshop is for you! 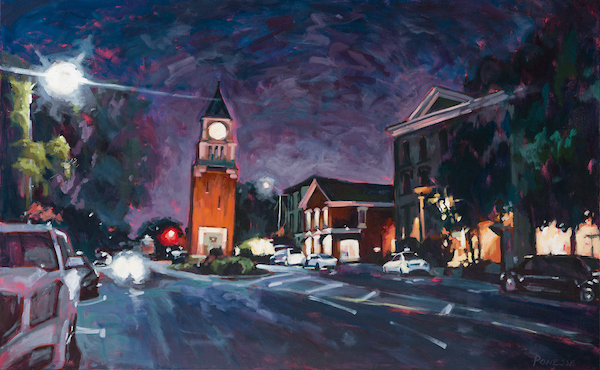 Instructor Julie Ponesse will demonstrate her process for creating energy, movement, and freshness in her paintings. A number of exercises are guaranteed to help you create loose and exciting brushwork in your own work. Contact Nell Crook at ncrook@gallerystratford.on.ca or 519.271.5271 ext. 223 to register. Following on the heels of a very successful evening last Thursday talking all about creativity with James Strecker, this is the second event in the inaugural fall lecture series at Mikreations Gallery in Virgil. This event will be all about collecting original art. Art prices today are soaring at such a rate that the highest have been called nothing short of “obscene.” Even art that destroys itself, such as Banksy’s “Girl with Red Balloon,” seems to hold its value! So, given these two extremes, is there still value in original art? If you love art, how do you start a collection? How to you rejuvenate and refresh an exisitng collection? How do you give art as a gift? What can you do to encourage children to invest in art? We will discuss these questions and more, led by a panel of art experts and enthusiasts from the Niagara community. All are welcome so feel free to invite your friends. This is a FREE event. Mikreations Gallery, 1547 Niagara Stone Road, Virgil. I am excited to be co-hosting a couple of events this November with Mike Penner, owner of Mikreations Art & Framing Gallery. Both events aim to explore the nature of creativity, creators, and the original works of art they create. For the first event, “Creativity & Creators in the Arts,” poet and journalist James Strecker will read from his new book of poetry that explores the lives — experiences, lifestyles, inspirations, etc. — of creativity people. Afterwards, James will ask me a series of questions about my life as an artist, my creative process, etc. 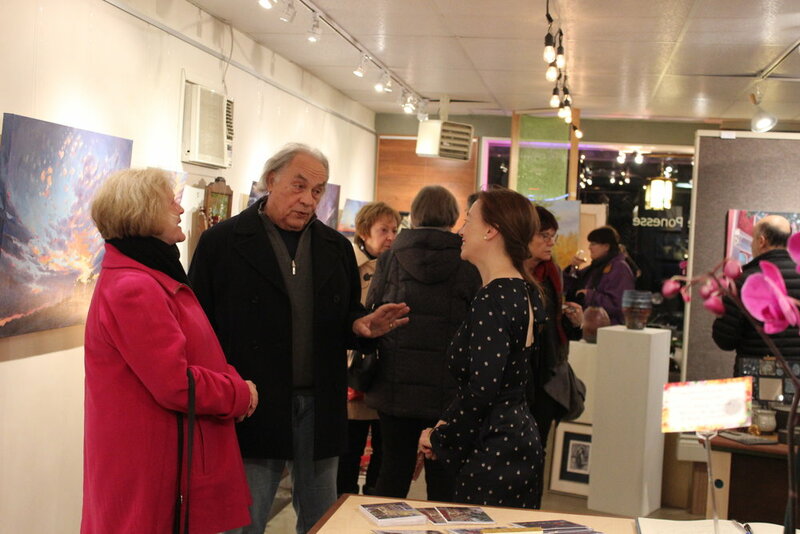 Mikreations Gallery is a beautifully curated gallery in Virgil. Join us on Thursday at 7 if you are in the area. Light refreshments. Bring a friend. All are welcome. This small-group class will focus on painting the landscape on location in some of my favorite spots near Niagara-on-the-Lake. We will focus on honing in on a subject, simplifying the complexity of a scene, and creating a striking composition. Exercises will encourage a focus on value and big shapes, capturing the colour and light of a scene, and creating loose, expressive brushwork. This workshop will help to demystify some of the complexities related to how painters use colour to grab the eye. Exercises will focus on the layering of, and relationships between, colour, and how to create clean vibrant colours that relate to each other harmoniously. You will gain an understanding of how to mix stunning colour combinations from a limited palette, how to amplify the colours you see, and how to use colour to enhance your compositions. This 2-day workshop is for painters with some experience who would benefit form one-on-one instruction to advance their skills to the next level. 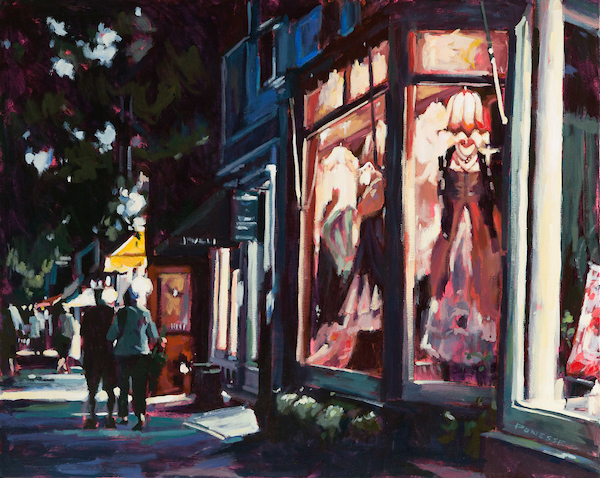 Emphasis on value, simplifying complex scenes, developing a colour story in your pieces, and painterly brushwork. Demos, exercises, and discussions of concepts designed around these aims. I will help participants to work through a painting from start to finish, including helping to identify challenging areas and propose solutions to move the piece forward. For more information or to sign up for the class, contact the Pumphouse (office@niagarapumphouse.ca or 905 468 5455) or feel free to email me directly through the contact form on this website. I will be teaching 2 classes at the Pumphouse in August. The first is one on light and shadow. Renoir said “No shadow is black, it always has a colour.” In this class, you will learn how to mix paint to capture the dramatic differences between light and shadow, brightness and dullness, vibrancy and paleness. Using a very limited palate, we will focus on colour mixing to help you to capture the colours present in nature at different times of day and under different lighting conditions. This two-day workshop will include colour theory instruction and simple exercises, and the chance to complete a small painting building on these colour principles from start to finish. This workshop is for those wanting to loosen and freshen up their brushstrokes, and who are willing to step (a little) outside their comfort zone to do so! We will complete a number of exercises using a limited number of brushstrokes -- maxing out at 40!!! You will be amazed at the looseness this creates and in all the happy little accidents that come from having only a limited number of strokes at your disposal. Colour mixing workshop at Mikreations Gallery (Virgil). Contact info@julieponesseart.com or Mikreations (905) 468-7938 to register. I'll be teaching a 2-day workshop on painting interior spaces at the Niagara Pumphouse at the end of May. Learn how to create dynamic interior compositions full of life, energy, intimacy, and movement. 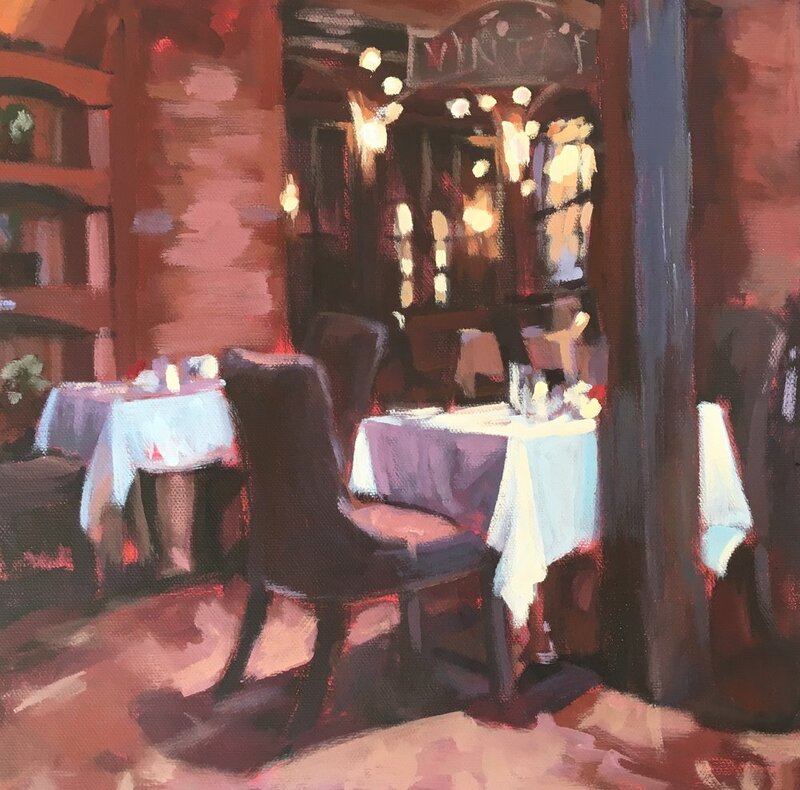 We will focus on capturing light in interiors, minimizing detail to create a focal point, and creating inviting scenes into which the viewer will want to enter. 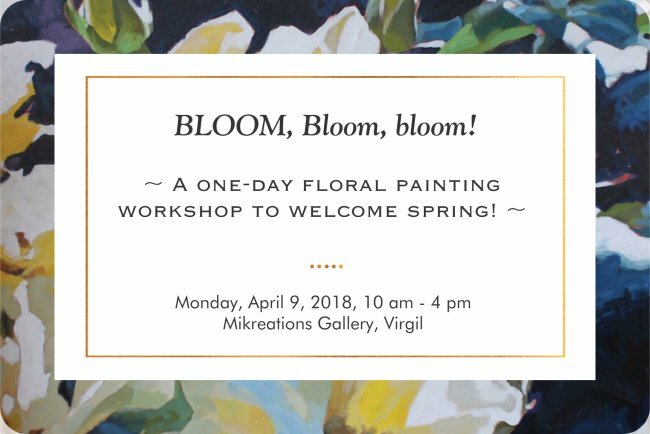 I am thrilled to be teaching a one-day floral painting workshop at the lovely Mikreations Gallery in Virgil on April 9. The workshop will focus on painting loose and lively florals that breathe and are full of life! We will focus on tips and tricks to simplify different types of flowers--roses, irises, bulb flowers, and more--and discuss appealing colour stroies to create striking images. Participants will aim to complete a 12"x12" floral painting by the end of the day. This workshop is currently full but we may offer more of its kind in the future. For the month of March, I have a solo show of nocturnes (i.e. night paintings) at Mikreations Gallery in Virgil. The openings are Friday, March 2 (7-9 pm) and Saturday, March 3 (2-4 pm). I have a variety of architectural pieces, mostly of Niagara-on-the-Lake, as well as some landscapes, which explore the theme of light play in the darkest times of day. If you missed the openings, never fear! The exhibit is on until the end of March.